This is the only App Landing Page you will ever need, this design has an extremely well layered PSD where you will be able to find everything you need in an instance. All objects and layers are perfectly customisable and everything is grouped within it’s respective place. 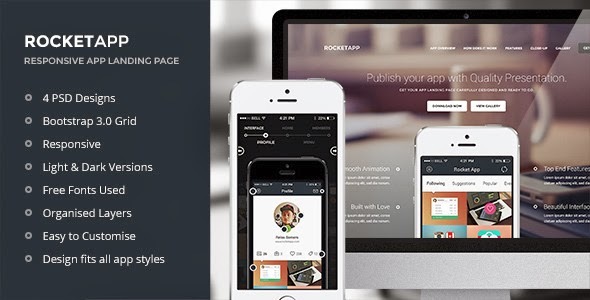 RocketApp PSD is a high quality App Landing Page that will wow your customers, it has a timeless, spacious design with neutral color scheme that will fit any kind of app. Item Reviewed: Light and Dark Responsive App Landing Page 9 out of 10 based on 10 ratings. 9 user reviews.